Our Milky Way galaxy is still enduring the effects of a near collision that set millions of stars moving like ripples on a pond, the Gaia star mapping mission has shown. 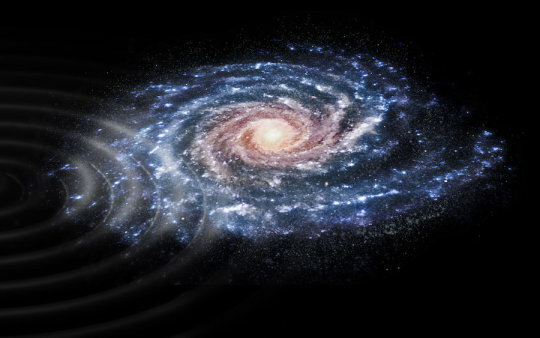 Artist's impression of a perturbation in the velocities of stars in our Galaxy, the Milky Way, that was revealed by ESA’s star mapping mission, Gaia. ESA's star mapping mission, Gaia, has shown our Milky Way galaxy is still enduring the effects of a near collision that set millions of stars moving like ripples on a pond. The close encounter likely took place sometime in the past 300-900 million years. It was discovered because of the pattern of movement it has given to stars in the Milky Way disc -- one of the major components of our Galaxy. The pattern was revealed because Gaia not only accurately measures the positions of more than a billion stars but also precisely measures their velocities on the plane of the sky. For a subset of a few million stars, Gaia provided an estimate of the full three-dimensional velocities, allowing a study of stellar motion using the combination of position and velocity, which is known as 'phase space'. In phase space, the stellar motions revealed an interesting and totally unexpected pattern when the star's positions were plotted against their velocities. Teresa Antoja from Universitat de Barcelona, Spain, who led the research couldn't quite believe her eyes when she first saw it on her computer screen. One shape in particular caught her attention. It was a snail shell-like pattern in the graph that plotted the stars' altitude above or below the plane of the Galaxy against their velocity in the same direction. It had never been seen before. "At the beginning the features were very weird to us," says Teresa. "I was a bit shocked and I thought there could be a problem with the data because the shapes are so clear." But the Gaia data had undergone multiple validation tests by the Gaia Data Processing and Analysis Consortium teams all over Europe before release. Also, together with collaborators, Teresa had performed many tests on the data to look for errors that could be forcing such shapes on the data. Yet no matter what they checked, the only conclusion they could draw was that these features do indeed exist in reality. The reason they had not been seen before was because the quality of the Gaia data was a huge step up from what had come before. "It looks like suddenly you have put the right glasses on and you see all the things that were not possible to see before," says Teresa. With the reality of the structure confirmed, it came time to investigate why it was there. "It is a bit like throwing a stone in a pond, which displaces the water as ripples and waves," explains Teresa. Unlike the water molecules, which settle again, the stars retain a 'memory' that they were perturbed. This memory is found in their motions. After some time, although the ripples may no longer be easily visible in the distribution of stars, they are still there when you look in their velocities. The researchers looked up previous studies that had investigated such 'phase mixing' in other astrophysical settings and in quantum physics situations. Although no one had investigated this happening in the disc of our Galaxy, the structures were clearly reminiscent of each other. "I find this really amazing that we can see this snail shell shape. It is just like it appears in text books," says Amina Helmi, University of Groningen, The Netherlands, a collaborator on the project and the second author on the resulting paper. So the next question was what had 'hit' the Milky Way to cause this behaviour in the stars. We know that our Galaxy is a cannibal. It grows by eating smaller galaxies and clusters of stars that then mix in with the rest of the Galaxy. But that didn't seem to be the case here. Then Amina recalled her own and others studies of the Sagittarius dwarf galaxy. This small galaxy contains a few tens of millions of stars and is currently in the process of being cannibalised by the Milky Way. Its last close pass to our Galaxy was not a direct hit -- it passed close by. This would have been enough so that its gravity perturbed some stars in our Galaxy like a stone dropping into water. The clincher was that estimates of Sagittarius's last close encounter with the Milky Way place it sometime between 200 and 1000 million years ago, which is almost exactly what Teresa and colleagues calculated as an origin for the beginning of the snail shell-like pattern. So far, however, the association of the snail shell feature with the Sagittarius dwarf galaxy is based on simple computer models and analyses. The next step is to scrutinise the phenomenon more fully to gain knowledge of the Milky Way. The scientists plan to investigate this galactic encounter as well as the distribution of matter in the Milky Way by using the information contained in the snail shell shape. One thing is certain. There is a lot of work to do. "The discovery was easy; the interpretations harder. And the full understanding of its meaning and implications might take several years." said Amina. Gaia is one of ESA's cornerstone missions and was designed primarily to investigate the origin, evolution and structure of the Milky Way. In April, it made available its second data release, which is the data that made this discovery possible. "This is exactly the kind of discovery we hoped would come from the Gaia data," says Timo Prusti, Gaia project scientist at ESA. "The Milky Way has a rich history to tell, and we are starting to read that story."